The current Sino-Japanese tension under the Japanese leadership of Shinzo Abe with his determination to revise the Japanese constitution for a more powerful military and a more active foreign policy to counter the meteoric rise of contemporary China reveals a deeper existential crisis of identity in the Japanese psyche of our time, torn in between two conflicting orientations: namely, racism (superiority complex) and inferiority complex. The first orientation which has contributed to the existential crisis of identity in the Japanese psyche of our time has to do with the relationship between Japanese racism (superiority complex) and the weakness of modern China. Japanese racism against (or condescension towards) the Chinese did not exist in the pre-modern past, because, for millennia in East Asian history, Japan had been a backward area (or vassal) in the civilizational shadow of Imperial China known as the “Middle Kingdom” in this Sinocentric part of the world. In fact, the converse was true for millennia, in that the Japanese suffered from some form of inferiority complex towards the dominant Imperial China in the pre-modern past; after all, much of Japanese culture (including the Japanese language) was Chinese in origin. It was only after the successful modernization of Meiji Japan by learning from the West and joining the rank of Western powers in the game of colonial imperialism near the end of the 19th century and the beginning of the 20th century that Japan started to look down on China as “the sick man of Asia,” especially after winning the Sino-Japanese war of 1894-95 (at a time when the Chinese Empire under the Manchu Dynasty was collapsing) and later invading and occupying part of mainland China in the 1930’s. These decades (from the second half of the 19th century to 1949, when the Communists took over mainland China and Mao Zedong formally declared that “China has now stood up”) also constituted what the Chinese historians now call “the one hundred years of humiliation” during which they greatly suffered from Japanese (and Western) imperialism. Japanese racism reached its peak during WWII, when, for a few years, it invaded and occupied much of Southeast Asia and East Asia and in the process committed enormous atrocity towards the “inferior” natives (mostly Asians). For the first time in its history, Japan thought of itself as “number one” in this part of the world (long dominated by China for millennia) and looked down on other Asians as “inferior” (and looked up towards “whites” like the Western Europeans and Americans for emulation). The Imperial Japanese surrender to the U.S. in 1945 after the atomic bombings of Nagasaki and Hiroshima did not completely eliminate Japanese racism for two main historical reasons. The first historical reason for the continuation of Japanese racism after WWII has to do with the Cold War against communism, especially in regard to the Communist takeover of mainland China in 1949, the Korean War in the early 1950s, and the Vietnam War in the 1960s and 1970s, which put Japan on the side of the U.S. to become an indispensable ally in the subsequent Cold War against its communist foes. Unlike East Germany and West Germany after WWII, both of which were under pressure (by the Soviet Union and the U.S., respectively) to condemn and cleanse its Nazi imperial past once and for all, post-WWII Japan benefited from the preoccupation of the U.S. with using Japan as an ally in the Cold War against Communist China, the Soviet Union, North Korea, and later North Vietnam. Unlike post-WWII West Germany, another ally of the U.S., where it was against the law to deny the Holocaust, there was no shrine nor temple to commemorate the Nazi war criminals, and the victims of Nazi atrocity were offered financial compensation — post-WWII Japan did not go through this process of complete cleansing of its imperial past. 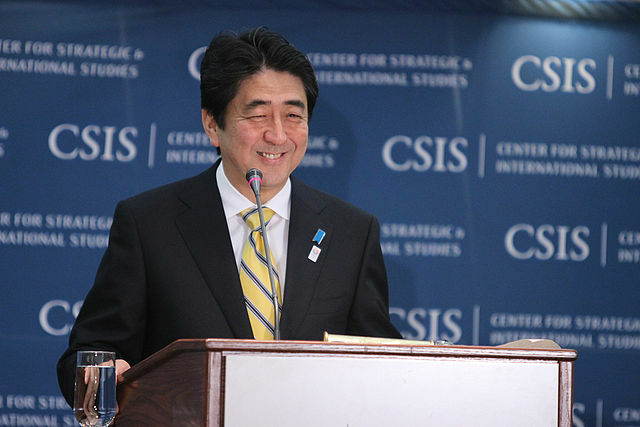 On the contrary, Japanese leaders have time and again visited the controversial shrines to commemorate their WWII war criminals, refused to officially offer financial compensations to the victims of imperial Japanese atrocity, even regarded the use of “comfort women” for Japanese soldiers in occupied territories during WWII as “normal,” and went so far to deny, by some more nationalistic Japanese, the historical events of Japanese invasion and atrocity. In its preoccupation with the Cold War against the communist regimes in mainland China, the Soviet Union, North Korea, and North Vietnam in this part of the world, even though they were all victims of Japanese aggression during WWII, the U.S. had no interest in forcing Japan to undergo this process of complete cleansing of its imperial past to benefit its Communist foes, which, not surprisingly, were not pleased about it. The current disturbing comments and deeds by Japanese officials under the nationalistic leadership of Shinzo Abe in regard to Japan’s imperial past during WWII is only the latest chapter of this toxic historical legacy. For instance, “on Dec. 26, 2013,…Japanese Prime Minister Shinzo Abe visited the Yasukuni Shrine in Tokyo which honors some 2.5 million Japanese war dead, including those convicted of war crimes during World War II,” as reported by Manuel Almario for the Philippine Daily Inquirer on July 10, 2014. His government is exploring ways to revise history textbooks for Japanese students to make them “more patriotic” and proud of their imperial past; worse, they are even trying to revise “the 1993 Kono Declaration” in regard to the “comfort women” issue, as Tessa Morris-Suzuki aptly pointed out in the article “Japan and the Art of Un-Apologising” on July 16, 2014 for The Diplomat, that “the result is the Japanese government can truthfully insist that it has not withdrawn the Kono Declaration, while very effectively demolishing its credibility.” After all, Katsuto Momii, director general of NHK, added in 2014 that “comfort women” for Japanese soldiers during WWII was a “normal” practice in war times. Another NHK leader Naoki Hyakuta even denied the Nanjing massacre and suggested that it “never happened.” Later on, Masataka Kataoka, head of Alps, denied Japan’s aggression in China in the 1930s as an “invasion” at all and suggested instead that Japan was merely “helping” China to fight off American and European colonial imperialism. It was also at that historical moment of the Cold War against communism that the U.S. had no appetite to make Japan return some of the occupied territories to Communist China (which has led to the current Sino-Japanese dispute over the “Senkaku Islands,” also known as “the “Diaoyu Islands” in China), as Japan annexed the islands after winning the Sino-Japanese war of 1894-95. But this refusal of the U.S. and Japan violated the Cairo Declaration in 1943 among the U.S., the U.K., and (pre-Communist) China that any Japanese surrender required a return of all Imperial Japan’s territorial conquests, including the islands in question. Instead, the U.S. handed over the islands (which it had administered since 1945) to Japan in 1972 in the midst of the Cold War against its Communist foes (e.g., Communist China), in violation of the Cairo Declaration. But with the death of Mao Zedong in 1976, mainland China underwent a tectonic change never seen before in human history. The meteoric rise of mainland China since the economic reforms of the 1970s (under the leadership of Deng Xiaopeng) has dethroned the Japanese economy from number 2 in the world to number 4 nowadays (after the U.S., China, and India, according to the recent ranking of major economies by the World Bank, in a measure by GDP PPP). More precisely, according to an estimate by the IMF, the current Chinese GDP (PPP) is about USD 15.3 trillion, whereas the Japanese one is about USD 4.8 trillion. Even better, China is destined to replace the U.S. as the world’s largest economy by the end of this year (2014), according to the most recent estimate by the International Comparison Programme in the World Bank in early 2014. This meteoric rise of the Chinese economy has also transformed its military as the third most powerful in the world (only after the U.S. and Russia, with Japan in the tenth place, according to the 2014 GFP ranking). And increasingly, it is China, not Japan, which becomes more influential on the world stage, not only in the economic arena but also in the diplomatic, military, and cultural ones. The current discourse about “China’s return to greatness” in mainland China, especially under the new leadership of President Xi Jinping, only adds to the increasing unease among the Japanese in their slow but growing realization that Japan is a declining power, by almost all relevant indicators (e.g., economic, military, diplomatic, demographic, etc. ), in a region which is fast shifting in favor of the dominant China as the next global superpower. But this Japanese nationalistic defiance (with its intense envy of the Chinese rise) is desperately futile in the long term, although it will make some waves in the short term, though with high economic and political costs. There is the high economic cost, because any Japanese military buildup will take away much needed resources from its ailing economy (for over two decades now) at the worst time, and this would mean the end of the “free ride” with minimal military spending that Japan had enjoyed for its economic prosperity in the post-WWII decades, as this is the classic “gun vs. butter” trade-off in economics. And there is the high political cost, because the Japanese nationalistic drive has already created political tensions with some of its sensitive and important neighbors, especially China, Russia, North Korea, and, shockingly indeed, even its regional ally South Korea. In any event, the Japanese condescension towards the Chinese since the 20th century is now increasingly countered by an opposite orientation, that is, the Japanese inferiority complex towards the Chinese, or more correctly, Japan’s steady return to its former inferiority complex (not much seen since the times of Imperial China in the pre-modern past), especially under a new China in the coming Sinocentric East Asia. The nationalistic leadership of Shinzo Abe in contemporary Japan will not be the last of its kind even after he is gone in some years from now, but the historical meaning of his foreign policy has much to do with the truly very painful transition of contemporary Japan to a new epoch of East Asia history, when Japan is a declining power and will eventually fall back to the shadow of its former self, as it has for millennia, this time in the orbit of “China’s return to greatness,” which is totally unacceptable (in a very painful way) to its obsolescent racism against (or condescension towards) the Chinese but will be gradually absorbed by its growing inferiority complex in the making. Dr. Peter Baofu is the author of 75 books and 77 new theories, all of which provide a visionary challenge to conventional wisdom in the social sciences, the formal sciences, the natural sciences, and the humanities, with the aim for a “unified theory of everything” -- together with numerous visions of the mind, nature, society, and culture in future history. For more info about his visions on the future of global affairs, see some of his 75 books titled “The Future of Post-Human War and Peace” (2010), “Beyond the World of Titans, and the Remaking of World Order” (2007), “Beyond Civilization to Post-Civilization” (2006), “Beyond Capitalism to Post-Capitalism” (2005), “Beyond Democracy to Post-Democracy” (2004), “The Future of Capitalism and Democracy” (2002), the 2 volumes of “The Future of Human Civilization” (2000), and so on.